More photos by Brian Avent (BA), Chris McVittie (CM), David Hoar (DH), Glen Bodie (GB), Jack MacDonald (JMacD), Jim Kneesch (JK), Pat Smart (PS) Roger Meyer (RM), Terry Carr (TC) at our DNCB Flickr site. 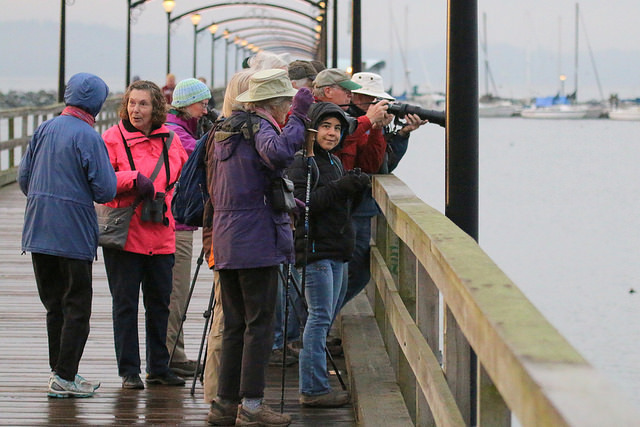 With a decent day forecast, at least to the afternoon, and a falling tide, the Petra’s group of 11 departed for the White Rock pier where we met with another 20 eager birders. We welcomed two Point Robert birders, Bobbie and Jamie, who had joined us previously at the Point and a few others we hadn’t seen for awhile like Johnnie Mac and Marti. Looking at the group photo and adding in the photographer, camera-phobic Maureen, and late comer Margaretha, it would seem that we had 32 in all… one of the largest we can remember! 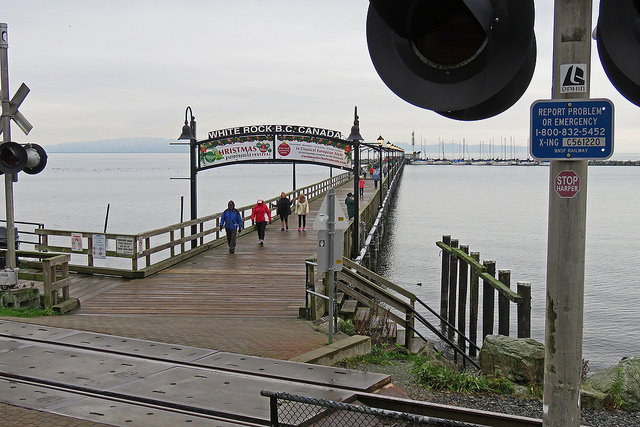 Part 1: White Rock Pier: With so many of us, it didn’t take long to spread out along the pier, but we can assemble a collage of sightings beginning with the shoreline where we had Mallards, American Wigeon, Northern Pintails, Buffleheads and some Canada Geese spread out along the beach. On the return trip from the end of the pier there were two Killdeer on the shore, and what appeared to be a Horned Grebe in distress. From the pier it looked like its feet were tangled in fish net, but when approached by a crow it got up and entered the water and swam off. along with Western, Horned and a few Red-necked Grebes. but plenty of Red-throated ones, especially in the deeper water south of the end of the pier. Our wish to see Eared Grebes and Black Scoters was not rewarded. On the tall cluster of pilings just inside the breakwater there was a pair of Bald Eagles, one of which was feasting on what appeared to be a gull (possibly a pigeon). A female Belted Kingfisher perched on the crossbar of a boat’s mast; another Kingfisher (male) landed on the rock breakwater. Pigeons lined the railings, and an elderly lady walked by covered in them… I’m assuming she feeds them regularly. (smelt?). Worth the price of admission right there! With the time approaching 10:00 am when the parking fees would start, we decided to head to Blackie Spit for the next step! Part 2: Blackie Spit: Travelling west along marine drive we paused for a moment at the base of the hill leading up from the beach for one last look for Black Scoters… negative there! Arriving at Crescent Beach, many of us had already spread out along the spit. On the west side at the beginning we counted five Eurasian Wigeon in a small flock. Later, on the east side, we were able to find another fifteen for a total of 20… and those were only males! None of us felt that we could identify a female but, obviously, there must have been at least an equal number to the males! We puzzled over why this area of the lower mainland has such a high concentration of this duck that once was consider unusual (actually, I think I was the only one that puzzled over it). There wasn’t much activity out on the water off the spit. However, once we got to the south side looking over to the community gardens, there was lots to look at in volume… Greater (and possibly Lesser) Yellowlegs, uncountable Northern Pintail, more teal, wigeon, and mallards. Very few birds in the bushes today; Northern Flickers, starlings, robins, crows, the usual stuff. On returning to the parking lot Terry had located a Black Oystercatcher at the base of the spit and another farther along the shoreline. The parking area had the usual large number of Ring-billed Gulls, always beautiful to look at, especially the juvenile (one of my favorites). Having exhausted Crescent Beach (we didn’t do the Dunsmuir gardens) we decided to call it a day and head off in different directions, some to lunch, others to home. Marion, Jean and Kirsten went to the Turf Farm at 72 where two rare birds had been reported on the VanBC site; a Slaty-backed Gull, and a Rusty Blackbird. Marion offered to phone me (Roger) if they found the birds and, sure enough, she called to report both were there side-by-side. A few minutes later while we were racing down the freeway, weaving in and out, she called again to say she was “just kidding”. Good one Marion… be aware! Next Tuesday, Dec 6, we will leave Petra’s Cafe at 7:30 and meet at Delta Heritage Airpark on 104 St about 8am to explore Boundary Bay Dike. The monthly Delta Nats meeting will be that evening at 7pm, at Benediction Lutheran Church: guest speaker Anita van Dikken, speaking about her Brazil Extreme Jaguar Trip. This entry was posted in *DNCB, Black Oystercatcher, Blackie Spit, Bonaparte's Gull, Dunlin, Eurasian Wigeon, Long-billed Curlew, Long-tailed Duck, Marbled Godwit, Red-breasted Merganser, Red-necked Grebe, Red-throated Loon, White Rock Pier. Bookmark the permalink.